Now I am not a sugar or sweets loving person at all and in fact barely use sugar for much but when I do, I am quite picky about it. I cannot stand product which use sugar substitutes like Splenda or Truvia. I think they have terrible aftertastes and honestly they are worse for you if you do your research. what a lot of people don't know even myself is all the things that sugar is actually in and how it affects our bodies. it has also become quite the epidemic causing ingredient when it comes to the problem our society has with obesity. "The American Heart Association recommends kids eat no more than 3 teaspoons of sugar a day; but the average American child eats more than 45 teaspoons daily. Sugar’s addictive nature, paired with the hidden sugar in our diets is significantly affecting our well-being, resulting in a lifetime of mood swings, fluctuating weight, sleep problems, and thyroid disease." I was more than thrilled AND eager when I was asked to review Sarah Wilson’s new book, I QUIT SUGAR Your Complete 8-Week Detox Program and Cookbook. with all the effort I've been making to transition my family into a cleaner and healthier lifestyle, this just seamed perfect to follow along with. 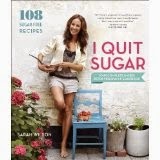 The synopsis says, "I Quit Sugar is a practical and encouraging week-by-week guide that shows you how to make one simple, but very significant change—quit sugar—to lose weight; boost energy; and improve your looks, mood, and overall health. With more than 108 delicious, sugar-free recipes—including an entire chapter dedicated to sugar-free kids’ recipes—you’ll feel so good and eat so well that you won’t even miss the sugar." First becoming popular in Australia, this program as quickly swept across the globe and I can see why. not only is this an enlightening book but it helps guide along even the most inexperienced dieter. The meals are super easy to follow and keep you feeling empowered and in control of your bodies health. I am more than excited to now have this as a part of my collection. Recommendation: I thought this was a great tool for the home and average family. I found it to be very informative and as far as price goes I would have to say I'd like to see it a bit cheaper for the e-version otherwise I prefer the hardcover.